Adobe describes a noise gradient as a gradient that "contains random components along with the deterministic ones that create the gradient." 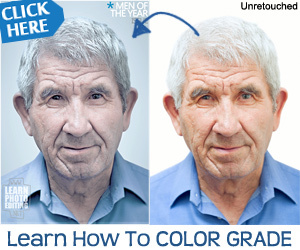 Allow me to translate: Photoshop adds random colors between the defined colors of the selected gradient. Did that help? No? 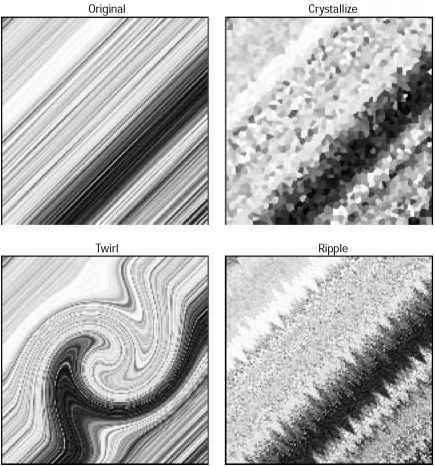 Then take a look at Figure 6-18, which shows examples of three noise gradients based on a simple black-to-white gradient. You could create these same gradients using the regular Solid gradient controls, of course, but it would take you forever to add all the color and midpoint stops required to produce the same effect. 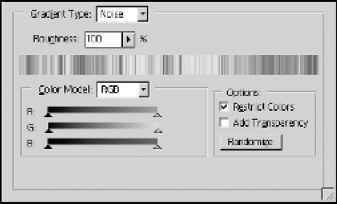 Figure 6-18: Here you see three gradients created using the new Noise option in the Gradient Editor dialog box. I created the first two using two different Roughness values; for the bottom example, I used the same Roughness value as in the middle example but selected the Add Transparency option. * Raise the Roughness value to create more distinct bands of color, as in the top example in Figure 6-18. Lowering the Roughness value results in softer color transitions, as you can see from the middle example, which I set at one half the Roughness value of the top example. * Use the color sliders at the bottom of the dialog box to define the range of allowable colors in the gradient. You can work in one of three color modes: RGB, HSB, or Lab. Select the mode you want from the pop-up menu above the sliders. Figure 6-19: Use the new Noise gradient option to create gradients like the ones you see in Figure 6-18. * The Restrict Colors option, when selected, adjusts the gradient so that you don't wind up with any oversaturated colors. Deselect the option for more vibrant hues. * If you select Add Transparency, Photoshop adds random transparency information to the gradient, as if you had added scads of opacity stops to a regular gradient. In the bottom example of Figure 6-17, I started with the gradient from the top example, selected the Add Transparency check box, and left the Roughness value at 100. * Click the Randomize button, and Photoshop shuffles all the gradient colors and transparency values to create another gradient. If you don't like what you see, just keep clicking Randomize until you're satisfied. Tip For some really cool effects, try applying special effects filters to a noise gradient. Figure 6 20 shows the results of applying the Crystallize, Twirl, and Ripple filters on the original noise gradient shown in the upper left example. Figure 6-20: I applied three effects filters to the original noise gradient to create some interesting random patterns.